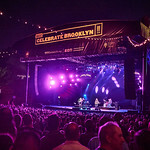 For those of us lucky enough be at the BRIC Celebrate Brooklyn! 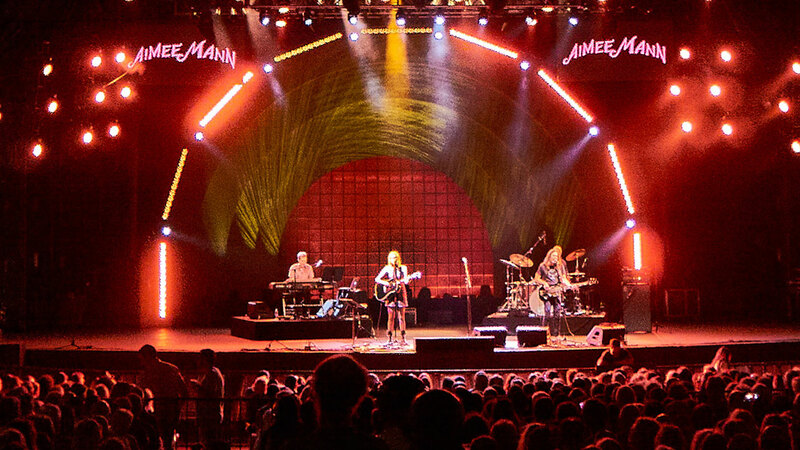 Festival in Prospect Park on a summer solstice Thursday night, or heard FUV's live broadcast, Aimee Mann's riveting show of new classics and vintage favorites was a chance to appreciate an FUV Essentials artist of the highest musical integrity. Brooklyn seems to suit Mann; she was certainly shining so brilliantly on this sublime, balmy night. The Los Angeles-based musician could even claim Brooklyn as a second home; she did record her only live album, 2004's Live at St. Ann's Warehouse, in the borough. On this night, she certainly appreciated this affectionate New York crowd in her typically understated way. The crowd was warm and respectful to one another and to Mann; her presence (and dry humor) helped coax out the community that sometimes gets misplaced in this big town. Carmel Holt and I co-hosted the live broadcast on WFUV and the radio audience added an extra dose of energy and a sense that the night was capturing a moment. Mann is a genius at being of this world and of this time. She's not precious about arrangements, so the older songs in her set were never trapped in the past. Even one of her encore choices, "Voices Carry," her breakthrough hit from her mid-'80s 'Til Tuesday days, felt completely free of nostalgia. In fact, Mann noted that the song's lyrics might be more relevant today. 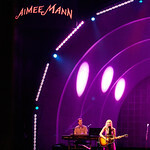 She's an ace songwriter at a creative peak (among many in her long career) and there's nothing like a live experience to focus attention on Mann's words and music. She memorably described her tenth, Grammy-winning album, 2017's Mental Illness, as "sad as it wants to be." 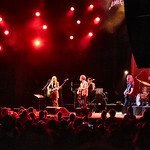 Even with their quieter tone, songs from Mental Illness, like "Patient Zero" and "Rollercoasters," earned a big crowd reaction. One of my favorites from that album, "Goose Snow Cone," brought the sound of sleigh bells into the summer night. 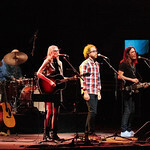 The encore also included a particularly wistful version of "Wise Up" from 1999's Magnolia soundtrack. 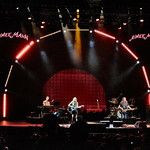 Mann's band included Jonathan Coulton, who co-wrote some songs on Mental Illness, as well as Paul Bryan on bass, Jamie Edwards on keyboards and John Sands on drums. Having Coulton and Superchunk on the night's bill was an embarrassment of riches for a free show. Thanks to all music lovers who buy tickets to the benefit shows — it does help pay for the cost of free ones, and for otherwise supporting the BRIC! Celebrate Brooklyn Festival. WFUV is thrilled to have a role in this most beloved New York City summer tradition. 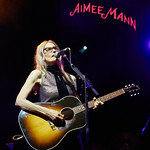 Listen to Aimee Mann's performance below and stay tuned for more Summer of FUV concert broadcasts too. 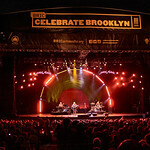 Next up, we'll be back at the BRIC Celebrate Brooklyn! Festival on July 25 to bring you Courtney Barnett, live on FUV. Find the full schedule here. 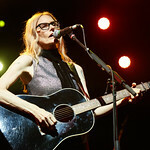 Aimee Mann on WFUV from BRIC Celebrate Brooklyn! 10 months ago ago by WFUV Public Radio. 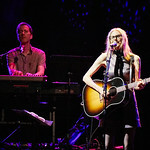 Aimee Mann on WFUV from BRIC Celebrate Brooklyn!